How many years have you been a freelance illustrator? What can your work be applied to commercially? As a wildlife Illustrator, my work can be applied to children’s books, wildlife magazines, food packaging (where wildlife themes are required), eco tourism and conservation organisations (all my work is created using recycled magazines), zoos and aquariums and to editorial assignments where the subject matter relates to nature, conservation and wildlife. Who are your top clients? 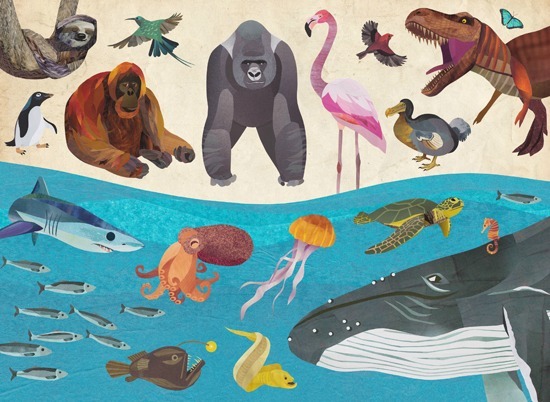 My favourite client to date has probably been the World Association of Zoos & Aquariums (WAZA) for whom I designed and Illustrated a commemorative poster print. With WAZA being a global conservation organisation and me a wildlife Illustrator, it was great to work on a commission where I’m passionate about the message and cause I’m Illustrating for. Apart from illustration what other skills do you have? Graphic Design, Website Design and Development and I make a mean gluten free brownie too! What’s your favourite sandwich filling? Jonathan will also be hosting the inaugural zero2illo LIVE one day Illustration Conference on 10th November 2012 in Nottingham, UK. Jonathan Woodward is an environmentally friendly wildlife Illustrator working in a traditional cut paper collage medium using recycled magazines. His hand crafted wildlife illustra… Show more. Send a message directly to Jonathan Woodward. Jonathan Woodward is an environmentally friendly wildlife Illustrator working in a traditional cut paper collage medium using recycled magazines. His hand crafted wildlife illustrations reflect his passion for nature and the great outdoors.